Few things are more closely associated with the roar of a fire engine, the clang of bells and the wail of a siren than the Dalmatian. 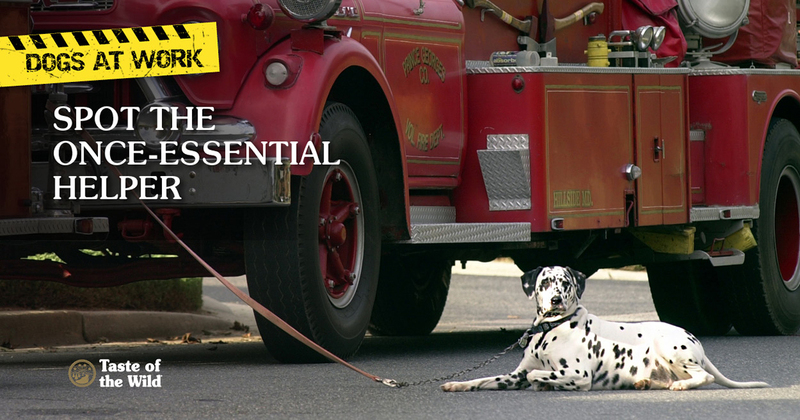 While he or she once was considered an integral part of the fire crew, today the Dalmatian is a rare sight at firehouses and is more likely to fulfill a less active role as mascot. The dogs also guarded the carriage and alerted the driver of highwaymen with nefarious intentions. And the more Dalmatians that accompanied a carriage, the more likely its occupants were wealthy or of higher social stature. When horse-drawn fire wagons came on the scene, it was a natural transition to use barking Dalmatians to clear a path for the rushing wagon. At the scene of the fire, these same dogs helped calm skittish horses and made sure no one stole the equipment or horses while the firefighters were doing their jobs. Back at the firehouse, the dogs made short work of rats and other vermin. But with the advent of motorized fire engines, there was little need for the Dalmatian, so it was essentially retired. Some firehouses may still keep one around, and firefighters occasionally adopt dogs they’ve saved from fires, but these are often other breeds. In the 1980s, fire departments started employing arson dogs, or accelerant-detection canines, to use their powerful noses to whiff out gasoline, lighter fluid and other flammables used to spark fires. Most arson dogs in the United States are trained and certified by the Bureau of Alcohol, Firearms and Tobacco or according to Maine Criminal Justice Academy guidelines in a special program funded by State Farm Insurance Company. Labrador retrievers or Lab crosses are typically preferred for this work because of their tracking abilities and easy-going natures. Each dog is teamed with a handler, usually an investigative firefighter or police officer, and undergo weeks of intensive training. After certification, arson dogs live with their handlers and usually investigate fire scenes every week. To keep them sharp, the dogs must be recertified every year. Now that you can entertain others with the history of the Dalmatian as firehouse dog, here’s one more bit of trivia for you: Dalmatians are born white and only develop spots as they grow. Who knew?